I always look forward to our camping trips in the summer, and this year was no exception. My mum has been visiting from India, and we were definitely looking forward to heading back into Jasper, and I wanted to make sure that mum's first ever camping trip was going to be a success. There is always friendly competition between Jasper and Banff National Parks - I must admit, I am firmly in the Jasper camp (no pun, honest.) I love the weird shapes of the Jasper mountains, and we are almost always guaranteed to see some beautiful wildlife. This year we were lucky enough to see elk, marmots, bighorn sheep and the best of all, a beautiful mama bear with two cubs. Adz, mom and I were thrilled to bits. I recently wrote a couple of posts on camping - including how I get myself organised and pack food - for The Kitchn, and as I was writing them, I realised how much I enjoy getting out and about in the fresh air. Adz loves it, and even my mum enjoyed the experience very much. 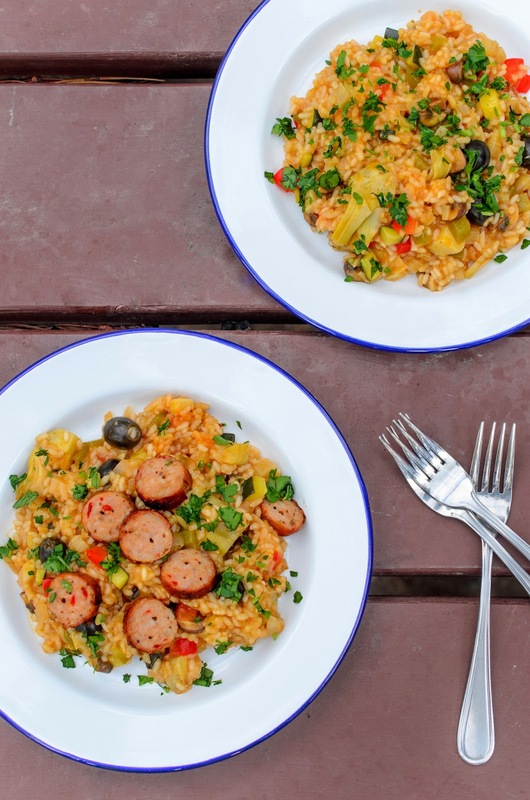 One of my favourite camping meals to make is this delicious paella, a riff on Ottolenghi's vegetable paella. I make lots of it, and we love having leftovers for picnic lunches when we're hiking or walking around in the park. Most of the ingredients for this dish are seasonal and I vary them to suit whatever I happen to have in my coolers at the time, which makes it a versatile dish to make outdoors. I make the paella vegetarian, but sometimes I will also serve with with fire roasted sausages. I found some delicious fennel and chili sausages at Ag Foods in Jasper and my mom and I loved them on our paella, while Kay and Adz ate the vegetarian version. 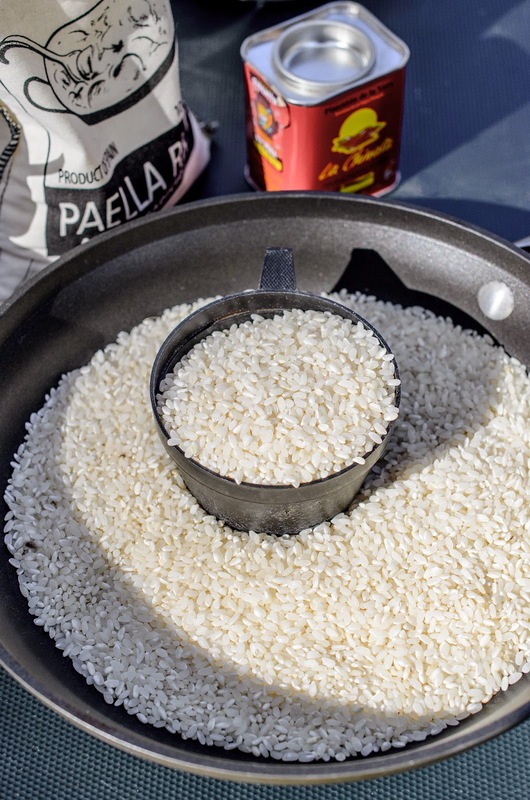 The nicest part of this dish is that you start off the initial prep on a campstove, but you can then cover your dish with foil and place it just off a campfire grill, which makes is simple and uncomplicated to make. And served with some of that cooking wine, it makes for a easy, healthy and hearty dish for those beautiful summer evenings. Which is why I am thrilled to announce another giveaway from the lovely folks over at Falcon Enamelware on The Tiffin Box. 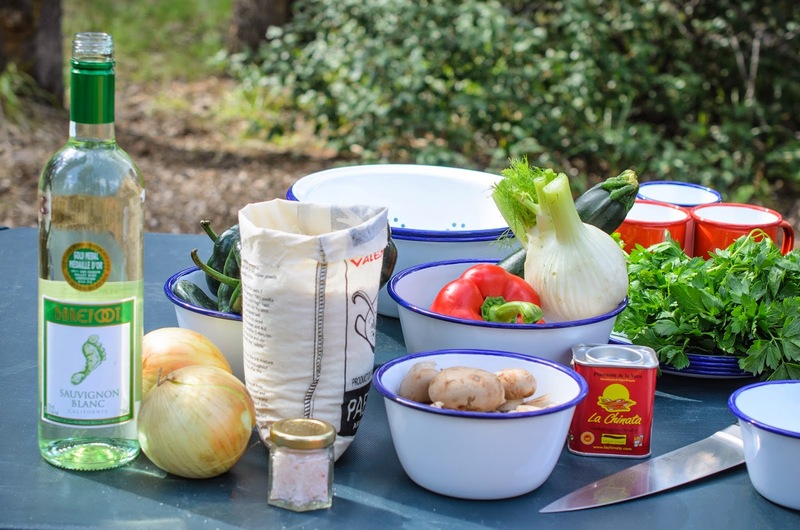 To get you started for the camping season, one lucky person will win a set of four red rimmed enamelware plates and a second winner will recieve a set of four enamel tumblers in assorted colours. To be in with the chance to win this fabulous giveaway, just read the simple rules below and enter. Winners of the Falcon Giveaway - Congratulations Julie G and Lillian Tse. I'll be in touch. 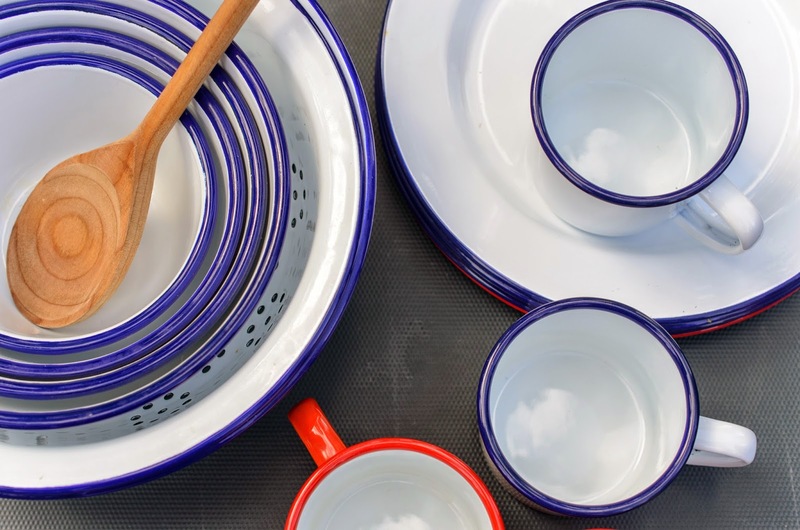 To participate in this giveaway, please do the following - head over to the Falcon Enamelware website, here, and take a look at their beautiful products. Then come back and let me know in the comments section what your pick for camping season season would be. Please note, that only comments that answer these questions will be in the draw for the giveaway. 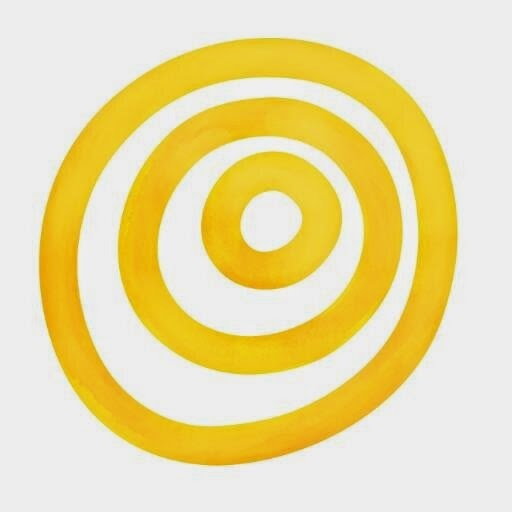 Follow me @michpetersjones and @FalconEnamel on Twitter, and leave me a comment saying you've done so. Please leave an email address or a way for me to contact you if you win. This is really important as if there is no way to contact the winner, I will pick a different one. This giveaway is open worldwide and you can enter from any country, as long as its legal. The giveaway ends on August 25th 2014 at 8 PM MST. I will pick a winner and contact them by email shortly afterwards. Please respond to the email as soon as you can. If I don't hear back within 2 days, I will choose an alternate winner. I will post the sets to the winner using Canada Post's parcel services. Please note that I will mark the package as a gift, but you will be responsible for an taxes or customs duties that your government levies on the package. Heat the oil in a large, cast iron saute pan and add the onion and fennel. Saute for a few minutes, until softened, then add the pepper and mushrooms. Fry together for about 3 - 4 minutes. Add the paprika and saffron, stir and add the rice and salt to taste. Stir until the rice is coated with the spices and vegetables, then add the wine. Cook for 2 - 3 minutes, until the wine begins to evaporate. Add the hot stock, stir, taste and season with a little more salt, if necessary. Stir in the olives and the artichoke hearts. Place the cherry tomatoes on top of the paella. Cover tightly with foil, and transfer to the edge of a campfire grill or turn the heat on your stove as low as it will go. Cook undisturbed for 25 - 30 minutes, then take off the heat and leave to rest for a few more minutes. 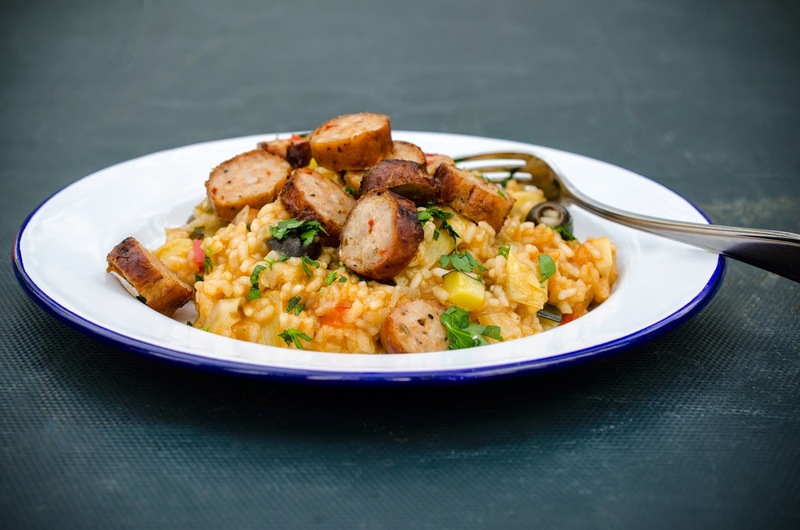 When ready to serve, open the foil, gently stir the rice and serve with sliced sausages and garnished with fresh parsley. My pick would have to be the mug. In addition to holding beverages, it can be used to serve food. I've even used an enamelware mug in place of a pot for camp-stove cooking (although I probably wouldn't with a shiny, brand new one). I've followed you and @FalconEnamel on twitter. I love the prep bowl sets and love the colander too! I would love to have Enamel Mugs! Followed @michpetersjones and @FalconEnamel on Twitter. I like the bake set the most. I love every single thing buuuut the tea pot is just ADORABLE! I love the enamel mug! I really like the falcon enamelwear tumblers. they are so pretty and useful for camping! the paella looks so inviting and delicious. I'd choose the Prep Set. I would love everything but the Prep Set and Pie sets besides the plates and mugs would be in my camping kit! I Love the Tea pot because even when we go camping every year in W. Va. it's so cool up there that I have to have my warm Tea and this pot would come in handy. I liked both your page and Falcon Enamelware on Facebook. I followed @michpetersjones and @FalconEnamel on Twitter. For camping season, I would love a prep bowl set... but never mind camping, the bake set would get used continuously in my home! Already following you on twitter, but now following Falcon Enamelware from @caribougrrl. I love the classic mugs. Do they come with hot chocolate?! I liked the Falcon page on FB and yours of course. I love it all!!! But the prep set would be first on my shopping list. (alpenmicho at rogers dot com) ... and of course I like making all your recipes. I like falcon on facebook and of course I already like you. I am now following you and falconware. I love your blog as well!!! I like the teapot and the mugs! I personally like the plates, mugs and colorful mini tumblers; they'd have so many uses! Thanks! I don't have nice camping dishes. I usually just buy some dollar store stuff before heading out. The prep bowls would be very useful! And I like the serving platter too! I like the prep set but the serving platter is awesome too! The prep bowls look awesome! Would love to win the plates. Super functional! Also following you and Falcon enamel on Twitter!